The incessant chatter of the observers of the whims of Trump, the litany of media about his “unpredictability” and “amateurism”, the permanent focus on his like for showing off, when one does not completely speculate on his mental health (as if the winner of a presidential election could be “half-stupid”)… To be short – the logorrhea that characterises ordinary Trumpology presents a big inconvenience: it dispenses its authors from engaging in real political analysis. The recurring defect of the dominant commentary and psychological babble prevents seeing anything else in the policy of Trump but at best – just a tissue of inconsistencies, a mish-mash without a guideline; it does not allow one to detect the worst case scenario – just a suicidal tendency, as if America was running to its own loss under the guidance of a captain who flipped out. The central question raised by the policy of Trump, however, is of another nature: beyond the whimsical personality – or so it seems to be – of the President, what are these policies a symptom of? What does it tells us about the evolution of the United States and its role in the world? their military power, in the end, remains without rival. For the US elites, their exceptional status is in the order of things: it reflects all the more the “manifest destiny” of the nation, because it provides the “supplement of soul” to the rapacity of those same elites, authorising limitless predation in the rest of the world. But since the failure of the intervention in Iraq (2003-2007) and the downfall of the ambitions of the “neocons”, everything suggests the collapse of this “order of things”. Hit by adversity, the “manifest destiny” is slipping away, and the illusion of unlimited hegemony vanishes in time and space. By attributing the “American decline” to the messy haphazardness of the President elected in 2016, most observers, in reality, mix up the cause and the effect. What made the US become unseated is not the policy of Trump. The relationship is exactly the opposite: if the policy of Trump is a policy of doodling, then, in fact, it is because the US loses ground. We could multiply the number of examples. The Republican candidate was elected by firing red cannon balls at liberal globalisation. But what could he do once he took the helm? Throw away the globalisation of exchanges via which Wall Street built its insolent prosperity? Renounce the model that Washington imposed for the benefit of its multinational corporations over the past half-century? Besides the renunciation of the “Trans-Pacific Partnership” (TTP), the policy of the new administration was limited to statements of principle, sometimes with assorted threats addressed to Beijing, purely rhetorically, and does little to undermine the walls of the Forbidden City. The White House knows that any reintroduction of protectionism would result in retaliatory measures that would penalise US companies. For a country whose federal debt held by foreign investors was literally blown away, playing with fire at such an abysmal level could be perilous, especially with regard to the US’ creditor country. The US economy is trapped at the bottom of the very globalisation that it once was the engine of enthusiasm and primary beneficiary of. Obviously, the table has turned. But it is too late to change the rules of the game on the grounds that the others have learnt to win in their turn. Concerning China, it continues its meteoric ascension, followed by India, which in 2018 will claim the rank of the 5th economic power of the planet, relegating France to 6th place. Responding to the criticism of Trump, Beijing affords itself the luxury of singing the praises of free trade. It is true that China can afford to do this: it is the number 1 exporter in the world, when the US is the leading importer. The US economy still has serious advantages, but its share in global GDP is decreasing. In 2025, China will claim 21%, and the US – 16%. In 2050, China will be at 33% and the US at 9%. When the Chinese shadows darkened the horizon, the “American dream” takes on the overtones of a nightmare. Since the last 30 years, for every three workers in the US one worker was replaced by a robot, the second one by a Chinese worker, and the third one is afraid of ending up like the previous two. The election of Trump is the fruit of this concern, but it is clear that his policies will not be able to remedy it. The question is not to know whether or not the US is going to cede first place: this is a certainty. It is also not about knowing when, because it is imminent. The only question is: under what conditions will this inevitable transition take place. The obvious unpredictability of Trump, his feverish agitation, and his histrionic behavior in sum are like a symptom of neurosis. It conveys the anguish of a superpower that feels the ground shifting beneath its feet, and which seeks to ward off the signs of its collapse by multiplying the protrusions. Can the heavy trend that is the slow decline of material production “made in USA” be curbed by a geopolitical jump? Trump tries to take on this challenge, but he stumbles every time on objective limits. This helplessness unfailingly gives to his policies an air of déjà vu, even though he tries at any price to stand out from his predecessors and to finally restore the image of a Great America that is finally back. For example, he claimed that he wanted to break the annoying habit of playing the rectifier of wrongs, but he continues nevertheless to preach to the whole planet. 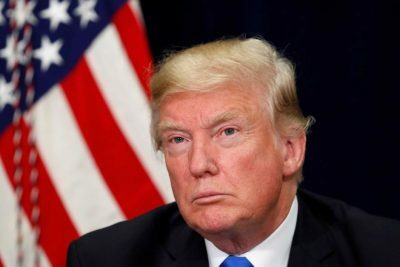 Lashing out at Russia, China, Syria, Iran, North Korea, Cuba, and Venezuela, he perseveres with the path of interference in all its forms, multiplying the absurd accusations (“Iran supports terrorism”), and sterile provocations (“ban muslims”). With him, the old still resurfaces under the new. He briskly invokes the “international community” and the law of the same name, but he offers the Zionist occupier a promised gift to Netanyahu, under the pressure of the lobby: the recognition of annexed Jerusalem as the capital of Israel. He exalts “human rights” to stigmatise the States that displease him, while at the same time securing an alliance with Riyadh to sign the death warrant of Yemeni children starved by a blockade and crushed under bombs. Under his reign, the formula of the Prince of Salina in “The Leopard“ applies perfectly to US diplomacy: “we must change everything so that nothing changes”. Indeed, the Pentagon learned lessons from the double fiasco of Iraq-Afghanistan, and no large-scale military operation was started in over a year. Trump is not George W. Bush, and his relationship with the “neocons” is complex. It is sometimes said in order to exculpate him that he would like to lead a different policy, but that the influence of the “Deep State” prevents this. This interpretation, if it was indeed true, would suppose disconcerting naivety being present in the current President. Was he unaware of the weight of the structures of the “Deep State” before taking the reins of the US administration? Did he have any idea about the joint and sprawling influence of the military-industrial complex and security agencies? The direction of this great country being a balancing act seems to be more consistent with reality, where the “Deep State” contributes to essential decisions in leading spheres to the extent of its weight – which is exorbitant. Trump is not the involuntary hostage of an occult and all-powerful apparatus, but the most exposed collaborator of this apparatus, a designed representative of oligarchy, which the “Deep State” represents both the most influential and least transparent layer of. Even if it experienced some incidents (such as the recent disgrace of Steve Bannon), this permeability of the Presidency under the influence of the “Deep State” explains the relative continuity of foreign policy from one presidency to the next on subjects of strategic interest. In Syria, for example, Washington continues to exercise its “nuisance value” using either the terrorist card [ISIS – ed] or the Kurdish card. The Secretary of State Rex Tillerson just tried to justify the presence of the 2,000 military personnel in Syria to facilitate “the departure of Assad” and “to counter the influence of Iran”. This explicit reference to “regime change” is revealing, as is the hostility towards Iran, the hobbyhorse of Donald Trump. But there is little chance that this colonial expedition in miniature form will obtain the desired result. When the Syrian Army will have reduced the last pockets of takfiris, it will go to reconquest the Syrian East, and the yankees, as usual, will pack their bags. Washington wanted to destroy the State of Syria, but this is a resounding failure. Trump must swallow the bitter pill of defeat, and his policy has the look of a rear-guard action. Under the pressure of the “Deep State”, the tenant of the “White House” provides the after-sales service of a policy that he cannot deny the premise of without giving the impression of surrender. Failing to use heavy artillery, he then sends the banderillas on everything that moves. Yesterday it was the takfiri conglomerate, today it is the “Syrian Democratic Forces”, even if it provokes the allied Turks, who entered the Afrin enclave to settle their account with the Kurdish militias armed by Washington. The incredible factory of knots that is the policy of the US has definitely tried everything in Syria. After their proxies were eliminated one after the other, the US is now condemned to be a wallflower while Russia calls the shots. So they throw embers into a brazier, which others – Assad, Rouhani and Putin – will extinguish in order to promote the development of their countries, and not – like the US – to rot the lives of other nations. This is a fact: even though the Pentagon has a nice looking budget of $626 billion, the United States is emerging from the main confrontation of the decade defeated. Molested by the Syrian issue, Donald Trump nevertheless tried, at the beginning of January, 2018, to exercise his nuisance value on another front. The protests in Iran, which offered him a new vantage point, were immediately exploited by the billionaire in the White House, mobilising all the resources of destabilisation and furiously tweeting his support for “regime change”, which thankfully fizzled out. Just like its obsession with North Korea, the Trump presidency’s obsession with Iran is doomed, indeed, to feed the same tensions and the same disappointments. The Iranians have no intention of gutting themselves to give the tenant of the White House pleasure. As for the North Koreans, they have enough means to progress in the nuclear domain to threaten Washington and its allies with terrifying retaliation should there be any aggression. And as Trump is neither a fool nor a moron, we can reasonably think that his imprecations against Pyongyang are thankfully doomed to remain at the paltry stage of “flatum vocis” (a phrase that could be translated as “verbal farting”) instead of turning into an atomic mushroom. Ultimately, we give this character too much merit by making him responsible for the decline, which he is nothing more than a symptom of. His rhetorical emphasis and his propensity for farce are effects of the causes that are found elsewhere. What condemns the tenant of the White House to a policy of doodling has nothing to do with his personal equation. This is the tilting of the world, and Trump can’t do anything (or no more than Hillary Clinton could in his position). The problem of the current President, however, is that he promised something that he is unable to provide: a miracle remedy that defends the US against an irreversible decline. His paradox is that he criticises the globalisation that is ruining “America” by applying the same rules as those that he made his fortune under in the past half-century. He can try all he wants to multiply the sabotage operations and to stigmatise a scapegoat (Putin, Assad, the Democrats, the press, immigrants), but he merely verbalises his impotence. If Trump barks but does not bite and prefers imprecations to actions, then it means that he does not have the capacity to act in his own way. Like any President of the United States, he is a part of a system that demands rates of profit and military financing, and he will be judged by his ability to provide this.